She thought of one thing, though, and it made her heart sink. She phoned the Østkraft control room, where the chief engineer confirmed her suspicion: A ship dragging its anchor in the narrow Baltic Sea channel between Bornholm and Sweden had severed the 60-kilovolt, 70-megawatt undersea power cablethat is the island’s only external source of electricity. It would take a repair crew more than six weeks to pinpoint the damage, haul the cable to the water’s surface, and fix it. And as Bornholm goes, so goes Denmark and the rest of Europe. TheEuropean Commission’s 20/20/20 Plan, for instance, states that by the year 2020, greenhouse gas emissions will be cut by 20 percent, while renewable energy usage and energy efficiency will both rise by 20 percent. Last year, theDanish parliament approved an even more ambitious target: to have renewables supply 35 percent of the country’s total energy needs—not just electricity but also heating and transportation—by 2020, and an incredible 100 percent by 2050. Can those targets actually be reached? Lost at Sea:Bornholm’s only link to the Nordic grid is via a three-phase undersea cable, which has broken four times in the last 10 years. 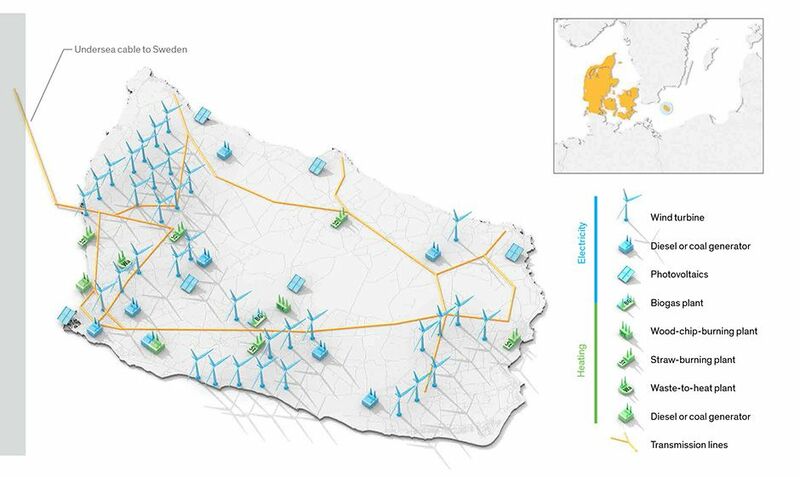 Dozens of experiments before and since have confirmed that there’s an upper limit of about 15 percent on the amount of wind power that Bornholm’s grid can absorb when in island mode. And to greater or lesser degrees, all power grids that have a substantial amount of wind and solar do the same thing,falling back on traditional “peak” generators to compensate for gaps in renewable output. Some grid operators also store electricity in pumped hydroor compressed-air installations or in industrial-grade batteries, but the latter aren’t yet economical, and the former can be used only in certain locations. Instead, EcoGrid’s people have installed smart grid controllers [PDF] in about 1200 households and a hundred businesses, and since April the controllers have been receiving a continuous stream of data based on the 5-minute price for electricity in theNordic electricity market, which covers Denmark, Finland, Norway, and Sweden. The controllers wirelessly communicate with designated appliances, and algorithms determine whether to turn each one on or off, based on factors like the time of day, the weather, and current, past, and future market prices.